Wear the right clothing – First, having delivery uniforms, shirts, hats and jackets, make customers feel more secure. Strangers coming to the door are not welcomed in many communities. 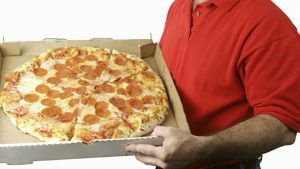 If delivery drivers don’t wear company uniforms, suggest they wear light colored clothing when making deliveries at night or when visibility is limited, especially in the rain. Other drivers are more likely to see them entering and exiting their delivery vehicles and crossing a street. Also, suggest non-skid shoes, particularly if it’s raining or snowing. Help them find the door – If your drivers will be delivering at night or in inclement weather, politely ask the customer to illuminate the address and entryway with an outside light. Give them flashlights – Provide flashlights to help drivers see the walkway and front porch. A good light will also enable them to avoid potholes, uneven sidewalks, exposed tree roots, toys and other potential hazards. Driving tips – Of course, they need to obey all traffic rules, but here are a few safe driving suggestions: Drive with headlights on, especially at dusk or when it’s raining or snowing. Keep the windshield washer fluid reservoir topped off so the windshield can be cleaned as often as necessary. Whenever possible, park where they won’t have to back up. Pull over for phone calls – Even if local ordinances allow it, they should never talk on a cell phone while driving, unless they can talk hands-free. Provide driver photos to customers – If your customers order online and you aren’t already doing so, consider adding a close-up photo of the driver to the order confirmation. That will help your customers feel safer when your driver arrives at their door. Restaurants take every precaution to ensure customers enjoy safe meals. Restaurant operators should also work closely with their delivery drivers to keep them safe and have an accident-free winter.